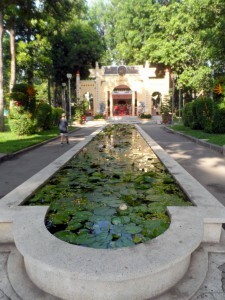 Here’s the first of a series of suggested routes for walking around Ho Chi Minh City. It will take you to some of the most popular sites, give you an excellent introduction to the city’s history and provide you with plenty of opportunities to soak up the unique mix of chaos and tranquility that is modern-day Saigon. Note: This post is now available as a GPS Guided Travel App. 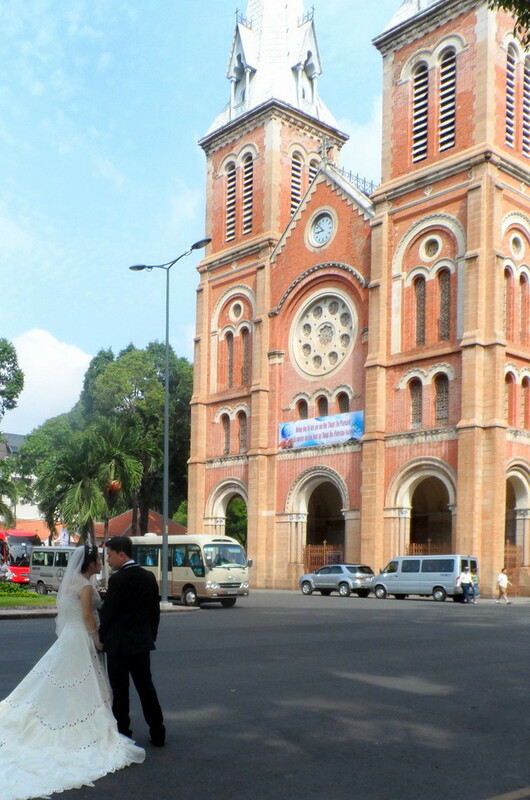 Get the most out of your visit to Saigon and DOWNLOAD it for free HERE. As per my last post, I suggest you start your day early in one of the many parks in the city. 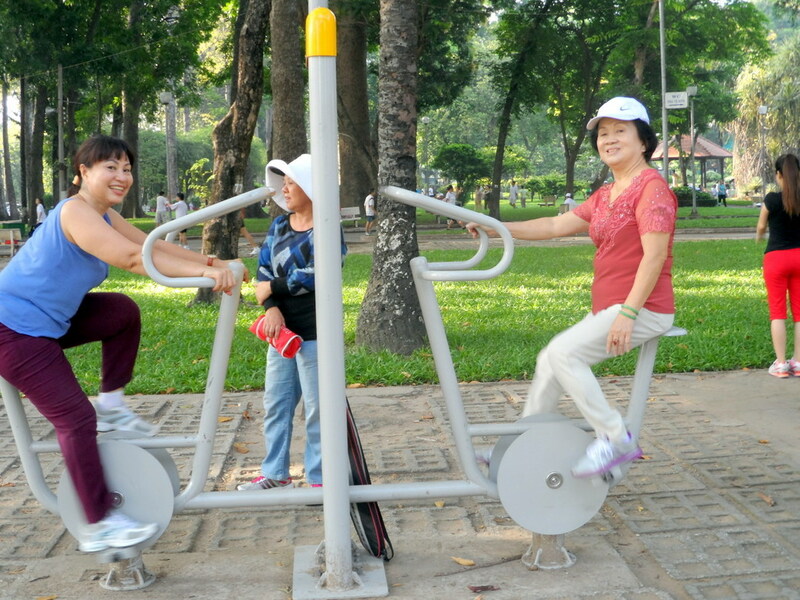 In the cool of the morning, take a stroll around Tao Dan Park located between Nguyen Thi Minh Khai Street to the north, Nguyen Du to the south, Cach Mang Thang Tam to the west and Huyen Tran Cong Chi. The park will come alive not long after sunrise and will be a hive of activity by 7 am. Start at the southwestern corner and work your way through to the north-east corner on Truong Dinh. Pick up a coffee from one of the street vendors along the way (for about 10 000 VND) and enjoy the spectacle of Vietnamese locals exercising, socialising and relaxing in the cool of the morning. The girls are working out, as are most of those hangin in the park. 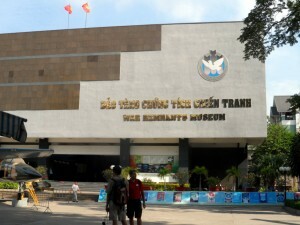 Next walk straight up Truong Dinh until you hit Vo Van Tan, turn right and walk until you see the War Remnants Museum on the corner of Vo Van Tan and Le Quy Don. This museum is a must-see on a visit to Ho Chi Minh City and will give you an insight into the tragedy of the Vietnam War. Yes, it is one sided, but the victors always write the history books so you wouldn’t expect anything else. It is quite graphic but well worth the visit. It opens at 7.30 am so get in early to beat the crowds. You may feel more comfortable contemplating these exhibits in relative quiet rather than alongside a throng of other tourists. Depending on what time you started out you may be getting pretty hungry by now. Or, you might just need to sit down and reflect on what you’ve just experienced. M2C Cafe is right across the road from the museum on Ly Quy Don. They have a good value breakfast menu, great coffee, and lunch specials. There are also some great cafes in and around 30-4 park. On Alexandre de Rhodes there is a large Highlands Coffee outside Diamond Plaza (which doesn’t open until 9.30am) and numerous street vendors around if you fancy sampling some of the fantastic street food. A Banh Mi (Vietnamese baguette), a bowl of Bo Kho (thick, flavoursome beef stew) or Pho (noodle soup) will keep you going for at least a few hours for around 10-40,000 VND. 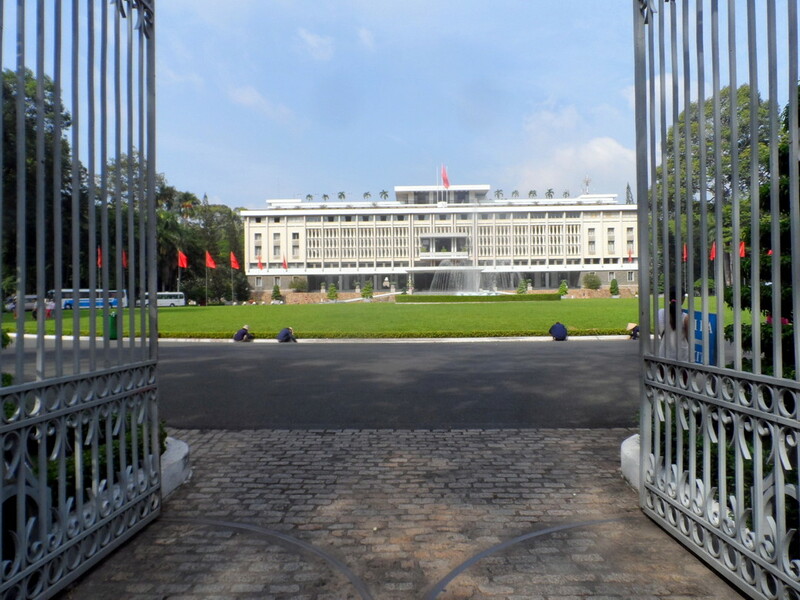 After a bit of rest, head over to the entrance of the Reunification Palace on Nam Ky Khoi Nghia. Here you can join a tour, pick up a personal guide or just pay the ticket and use the brochure provided for background information. 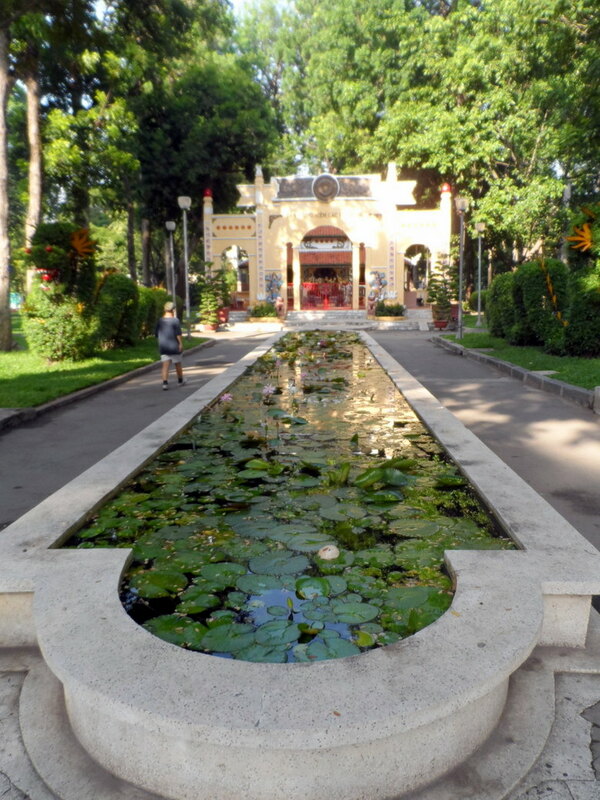 Add one more piece to your knowledge of Ho Chi Minh City and Vietnam. Leave at least an hour for your visit. You are spoilt for choice for lunch in this neck of the woods. Head up to Nha Hang Ngon at 160 Pasteur Street for a large selection of very reasonable Vietnamese dishes or drop into the elegant surrounds of Ngon 138 just down the road from the palace and select from a mind-boggling array of Vietnamese dishes from around the country. If you are looking for something a little bit more western try Au Parc Cafe at 23 Hàn Thuyên on the southern side of 30-4 Park, between Pasteur and Cong Xa Paris. All three choices are in beautiful colonial buildings with leafy outlooks so you can chill before the next leg of the tour. In the same street as Au Parc, you’ll find Propaganda, another excellent Vietnamese Restaurant, and several others. Notre Dame is a favourite place to have wedding photos taken. Next head for Don Khoi via the imposing Notre Dame Cathedral. Perched on the square at the end of the 30-4 park. Opening hours are between 5.30am and 5 pm but visiting hours are more restricted. If you are lucky, you’ll see some couples out having their wedding pictures taken. Of course, you may enter when services are on, but please be respectful if you are visiting at this time. There is an English mass at 9.30am on Sundays. Even if you can’t get in, the outside of the building is quite a sight, and it’s in a lovely setting close to the park, juxtaposed against Diamond Plaza and your next stop, the railway station like City Post Office. The Saigon Central Post Office is in a gorgeous colonial building from the late 1880’s that is in excellent condition. It’s still a working post office as well as containing souvenir shops, tour booking services, and kiosks. The interior is just as elegant as the outside with high vaulted ceilings, beautiful tiles and unique features such as the wooden phone booths. From the Post Office, head further south-east along Don Khoi taking the time to photograph more of the beautiful buildings still in fantastic condition. Along the street, you’ll find many high-end shopping choices, unique souvenir shops and galleries full of local art that is worth your time. By now it should be mid to late afternoon. Continue down Don Khoi, until you reach Le Than Ton. On your right, you will see the gorgeous City Hall that is now the Office of Ho Chi Minh City’s Peoples Committee. You can take a few pics now, but I have some better view points later in the walk. Across the road is a brand new ritzy shopping centre. Thankfully the architects designed it to fit in with the surrounds. If you didn’t know better, you wouldn’t guess it is only a couple of years old. Walk straight ahead and you will see the Elegant Hotel Continental on your left corner and just across the road the Magnificent Municipal Theatre, otherwise known as the Saigon Opera House. The building is only open during performances, but you will get a great view of the outside from the small park across the street. Consider taking in a show while you are here to gain entrance. The current performance of AO is internationally acclaimed. With a mixture of dance and acrobatics, there will be no language barriers to your enjoyment. 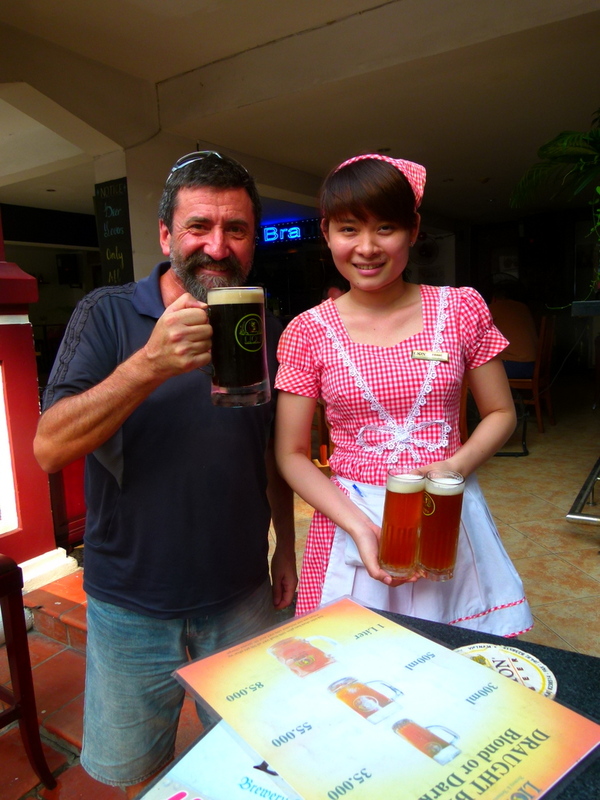 Just around the corner from the theatre is one of our favourite bars in this area, The Lion, it is right next to the Caravelle Hotel at 11-13 Cong Truong Lam Son and serves good quality German beers and bar snacks if you are a bit peckish. 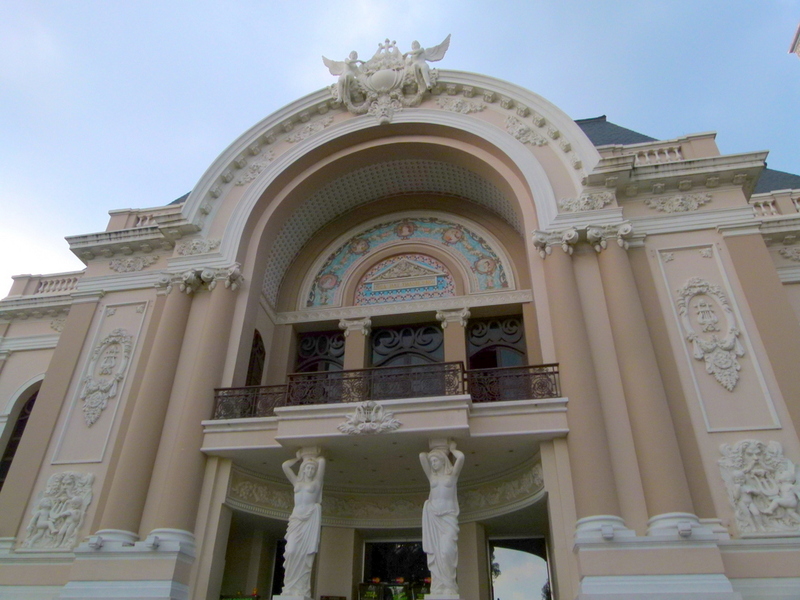 They have a buffet for lunch and dinner at that is superb value (Just 199 000 VND lunch for a Gazillion dishes.) They no longer have happy hour, but you can still grab a large beer (55 000 VND for 500ml) and enjoy the view of the Opera House while you take a break. For sunset head to the famous Rex Hotel and make your way up to the Roof Terrace. Here you will see great views of Ho Chi Minh square below, the new shopping centre, City Hall and right along Nguyen Hue (Walking Street), You can take a great photo at any time of the day, but it is especially beautiful when it is lit up at night. The bar has a two for one cocktails from 5-7pm and will sometimes have a live performance in the early evening as a bonus. 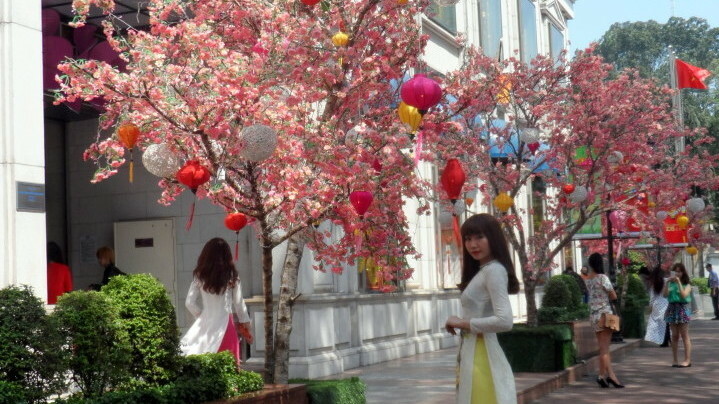 At some point in this tour, take a walk down Nguyen Hue (walking street). I prefer it in the night with the lights and fountains on in full effect. It’s become a real hub for tourists and locals alike. 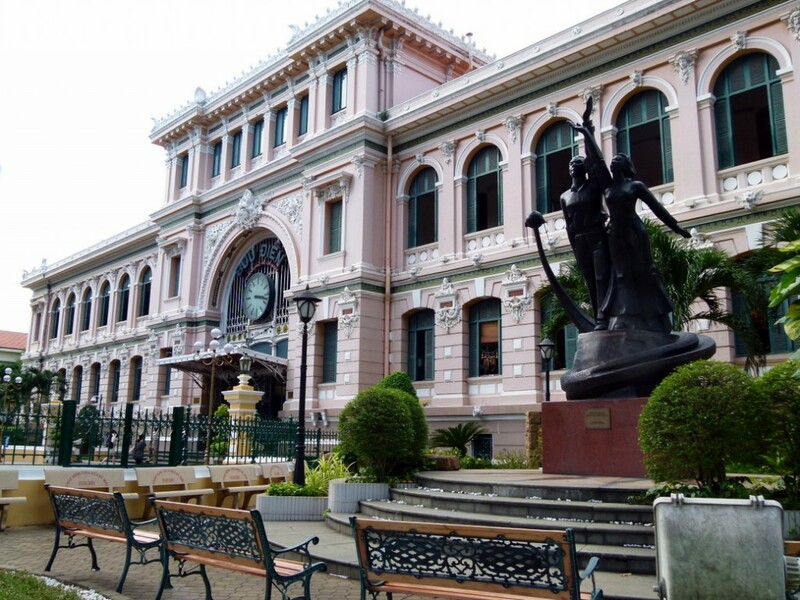 Colonial architecture, colourful lighting, fountains and one of the best selfie locations in the city, (in front of Ho Chi Minh’s statue) will ensure you get some excellent shots. It also has some of the city’s best cafes, bars and restaurants along its length so take some time out to explore them. After that, if you are not too worn out, select one of the many fantastic local restaurants for dinner. One of our favourites is Barbeque Garden, which now has two locations. The original is at 135A Nam Ky Khoi Nghia on the corner of Le Tan Ton, with the newest one right next to Ngon 138 at 134-136 Nam Ky Khoi Nghia. Note that these are a couple of blocks apart despite the closeness of the numbers. It’s just the way the streets are numbered here in Vietnam. We prefer the original, if the weather is nice, as you can sit out under the fairy lights in the garden. By the time you have dinner, I’d hazard a guess you are ready for bed. If not head out to one of the many bars and nightclubs in the area. One of our latest favourites is Pasteur Street Brewing Company, located in a small lane behind the Rex Hotel on Pasteur Street. More recommendations are coming very soon. Make sure you get plenty of rest as I’m now working on an itinerary for Day Two of walking around Ho Chi Minh City. And don’t forget, this post is now available as a GPS Guided Travel App. Get the most out of your visit to Saigon and DOWNLOAD it for free HERE. We are going to arrive in Ho chi Minh at around 10am. So by the time we get to the airport and hotel, we might be able to start the tour at around 1-2pm. Will we be able to cover the entire tour till evening, if we skip spending a lot of time at the park. How long does the tour normally take. Yes, I think so…but I would maybe recommend doing it backwards so you get to the park in the evening. You get similar activities in the evening as the morning which is really interesting. You can then get a quick cab ride or walk back to the centre for dinner or head to Ben Than Market for the night markets (take a look at the map on the day two walking itinerary) Depending on how long you spend at the museums, 4 hours should be fine. This is Very Very helpful. Thanks so much for this!